Underwater photography isn’t very common, but the visuals that can be produced from underwater photography is pretty incredible! There’s few DSLR users that risk having their Canon camera bodies underwater and I don’t blame them. You pay lots of money for your camera gear and the last thing you want to see is your Canon drenched in water and not being able to function. Water resistant, yes, but even the best Canon camera bodies can only sustain so much water before affecting your expensive camera – so why take the risk? With the amount of Canon underwater camera housings on the market, it’s hard to find the best waterproof Canon case for your underwater photography needs. Luckily, we’ve seen the reviews and we’ve compiled a list of the top-rated Canon underwater camera housings in the industry for you to pick from! First on the list is a camera housing for the Canon 80D. 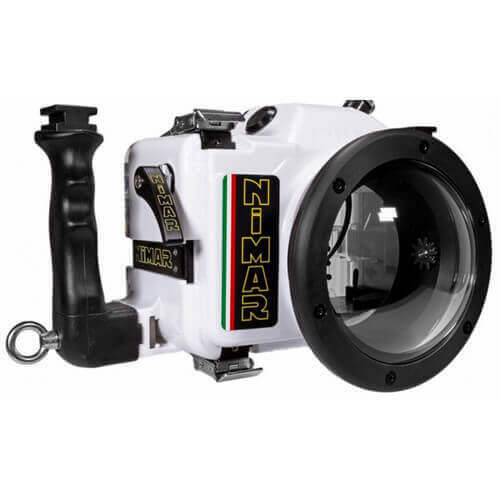 The Nimar is an underwater housing specifically designed for the Canon EOS 80D body. The Canon 80D is a solid mid-range camera that produces high-quality video and images. This watertight Canon housing is rated at 197 feet – which is much deeper than what a level 2 recreational diver would go. The camera housing comes with a manual 5-pin strobe connector that allows you to connect external strobes to your Canon DSLR – with the help of sync cords. The Nimar comes with a removable eyepiece that allows you to access the camera’s viewfinder. Shooting through the viewfinder may be somewhat of a problem because of the low light. Yet, some videographers prefer to use the viewfinder for better composition. The housing also comes with mechanical controls for regularly used Canon 80D functions. An underwater housing that allows you to dive deeper and stay underwater longer gives you the opportunity to capture more images. The Nimar underwater housing for the Canon 80D is perfect for that purpose. Additionally, there’s a moisture alert system built into the housing to tell you when there is a water breach. The only thing is that the housing doesn’t come with is a ready lens port. Having said that, you can connect a wide variety of lens ports for the specific lens you want to use with the housing. 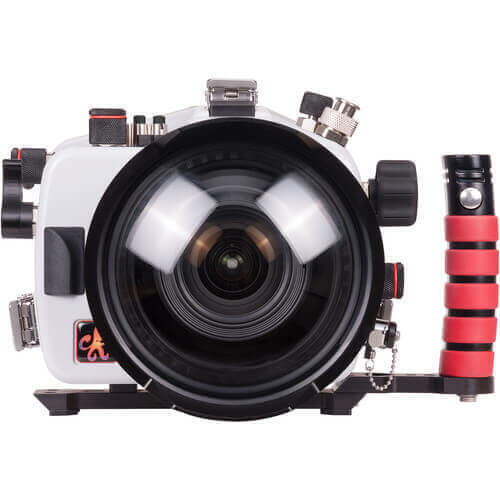 Ikelite manufactures some of the best Canon underwater camera housings in the business. The one we have selected to be included on this list is the underwater housing for the 5D Mark III, 5D Mark IV, 5DS and 5DS R.
The Ikelite Underwater Housing for Canon has a depth rating of 200 feet. This depth is more than what you would typically ever need. The optional back also come with a rating of 200 feet. But, the standard backing is only rated for 50 feet underwater. Although, you have the option to change the detachable back for a higher depth optional backing. 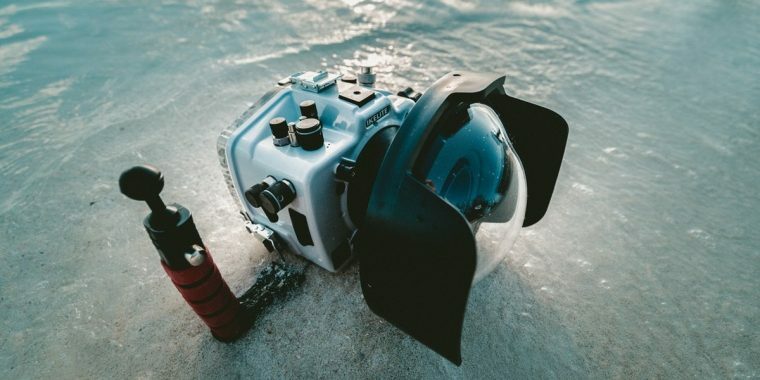 The underwater camera housing comes with Ikelite’s bulkhead strobe connector. This allows you to use an external strobe for a source of artificial lighting. This will be useful when facing low-light underwater conditions. You have both manual and TTL flash exposure controls with this Canon camera housing. The underwater housing also comes with a series of mechanical controls for controlling your camera’s major functionalities. Arguably, this is one of the major benefits of buying a camera housing specific for the 5D. A specific housing allows you to adjust camera settings below water with much more ease. The overall construction of the Canon 5D camera housing is made from white ABS with a Polycarbonate Body. The underwater housing comes with a clear back and an interchangeable DL lens port system. You have to buy the specific lens port as this depends on the kind of lens that you prefer to use with this underwater camera housing. 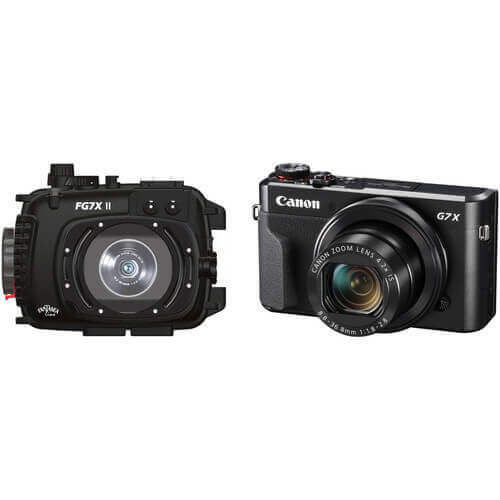 The Fantasea Line FG7X II is an underwater camera housing designed specifically for the Canon PowerShot G7X Mark II. The Canon G7X Mark II is one of the more popular and capable point & shoot systems out there on the market. It comes with a variety of shooting features including a wide zoom lens and a fast maximum aperture. These features make the Canon G7X Mark II perfect for underwater photography on vacations and underwater activities. The Fantasea Line FG7X II has a depth rating of 200′. Once again, that is way more than what you would ever need to shoot for recreational dives. Built with shock resistant material and a double O-ring main seal, you can rely on the Fantasea housing to keep your Canon sealed tight. The underwater housing comes with dual fiber-optic cable ports for mounting strobes. I’d recommend that you use strobes when shooting with this camera housing. This is because the small flash on your G7X Mark II will not be enough for darker conditions underwater. Additionally, the underwater housing comes with a moisture detection system that will alert you if water happens to seep through. With a fixed lens on the Canon G7X, the lens port on the Fantasea Line FG7X II is flat and is designed specifically for the Canon point-and-shoot. – so you won’t have to purchase any extra lens ports.